As a a prelude to the American Revolution, the French and British soldiers along with their American allies have embarked in great campaigns for control of the continent. Using unconventional military tactics the native population, with French backing, attempted to stand toe-to-toe with the British military machine. Move through the campaigns with new Rangers, Indians and French units adding a new aspect to the Hold the line series. 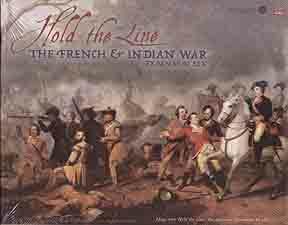 The French and Indian War expansion has 12 scenarios from the French and Indian War plus plastic French soldiers in white. It also has unique custom plastic game pieces for Rangers and Indians. Additionally, new tiles are included in this expansion game. You must own Hold the line: The American Revolution to play.